There are more than one way to slipstream (include) Service Pack 1 into your Windows 7 installation disk - this guide describes the manual way without third party software. What you need is your Windows 7 installation disk, the Service Pack (download it from here, one of the files titled windows6.1-KB97693 depending on your architecture - save it directly to your C: drive (if you don't, you have to adjust the paths used later to your chosen directories)), and the Windows Automated Installation Kit, available here. The SP1content folder contains an item called windows6.1-KB976932-X64.cab or similar, depending on your architecture (there will be two similarly named files, pick the large one) - extract this file into the same folder. After the extraction has finished, there will be the file NestedMPPContent and seven language files called KB976933-LangsCab 0-6. Extract all of them to the same folder. Now you have to edit three files via Editor - the first one is Windows7SP1-KB976933~31bf3856ad364e35~amd64~~6.1.1.17514 (the name might slightly differ from the file in your folder). Open it and scroll down to the last but one line. Change the "false" in allowedOffline="false" to "true", save and quit the document. Next, open update.mum and do the exact same thing as before. Afterwards, open update.ses. Look for the last two lines reading targetState=”Absent” and change "Absent" to "Installed". Afterwards you will find a new install.wim inside the SP1content directory. Pick that one and replace the original, located in C:\InstallCD\sources, with it (the new one should be a few hundred MB larger). Now you can use a tool like ImgBurn to make a new .iso-image out of the InstallCD directory and burn it onto a DVD (you need to make it bootable - see other guides here). How do I edit the file Windows7SP1-KB976933~31bf3856ad364e35~amd64~~6.1.1.17514, it’s encrypted and I don’t know how to encrypt it. How do you make the cd bootable? please reply to my email soon, thanks. What do you mean by encrypted? What does your cmd return when you process the service pack with the given command? You can make a CD bootable with ImgBurn as described here http://forum.imgburn.com/index.php?showtopic=11190 . Follow the guide from step 2 onwards and use only the extracted boot image from your DVD, since the guide concerns Win XP installation. I don’t know how to unencrypt it. i think the path in the last command is not correct, it should be something like this dism /unmount-wim /mountdir:C:\mnt /commit am I right? Nevermind, I went to another website and it said KB976933~31bf3856ad364e35~amd64~~6.1.1.17514.mum not the security catalog, it didn’t specify on this site .mum for the file, I have the windows 7 SP1 DVD but it can’t perform an in place upgrade which I was hoping for. However I don’t know why the cab folder kb976902.cab is not extracted to the same folder in this guide. Take note if you extract the file NestedMPPContent cab and not extract the KB976933-LangsCab 0-6 the dism will not detect the package for SP1 and give you an error. You’re correct max. U can use a DVD writer drive after unmounting the image and put it on a new DVD using windows cut and paste and rename the cd the same name as your original cd and it will act like your original cd only the install.wim updated to SP1 and no in place upgrade available so far. Note: you may have to put in the new Windows 7 SP1 DVD in the DVD write drive again to see the setup icon in My computer. How do you extract it and what do you mean by “the same folder”? 2) update.ses would looks garbled if edited with notepad. 3) edit the Windows7SP1-KB976933~31bf3856ad364e35~amd64~~6.1.1.17514.mum file, not the security catalog. 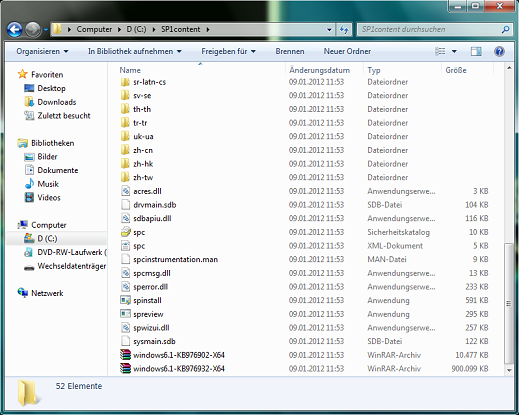 4) Turn off “Windows Search” service; close the explorer window when you are extracting the cab files into SP1content. With these 2 running concurrent with the cabextract, things will goes 10x slower. 5) As what alisdair said: updated image is actually in ‘C:\InstallCD\sources’ and not the ‘C:\SP1content’. Is it strictly necessary to download the 1.2GB WAIK in order to have dism?? ?